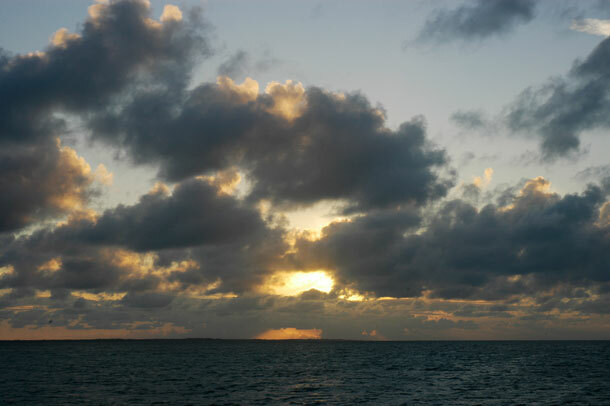 The sunset as seen from Matt Lowe’s Cay. We do a lot of waiting. Sometimes it is a relatively short wait, like waiting for the tide to change, or sometimes it is a longer wait, like waiting days (or maybe weeks) for the weather to turn. We never know what might happen to slow us down, so we always factor time into any wait â€“ like the wait for meeting people flying into the country. We have this wait when we are at home on land, also â€“ waiting for that friend to call as soon as she steps off the plane so you can jump into your car, zoom down the highway, and meet her in front of the airport perfectly timed as she steps out to the curb after picking up her luggage. Meeting someone when you are sailing can be slightly more involved. The Bahamas is a big place when you travel by boat. When meeting anyone it is nice to first be in close proximity of the part of the Bahamas they are arriving in. If you arenâ€™t already you need to get there and this, of course, means giving yourself a generous time window since invariably you will need to wait on the tide and the weather or something else and a 50 or 60 mile trip can take 2 or 3 days depending on where you are going. So, on April 15 we found ourselves back in the Abacos waiting to meet friends of a friend who were flying in on April 23 and chartering a boat out of Marsh Harbor. Although our wait was somewhat long, we found plenty to do, like laundry, restocking fresh food from the gigantic grocery store in Marsh Harbour, visiting the hardware store (as always), and internetting. We planned to do a little adventuring that week, but weather pinned us down for a few days. We did get to spend sometime in some of favorite Abaco anchorages, though, doing cleaning, making lists, and problem solving. Being that we are nearing the end of our journey and we just donâ€™t have anything new for this time period to write about, I thought it would be a good time for another status update. 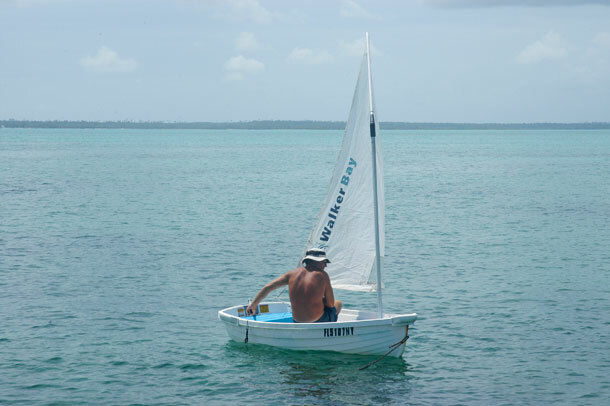 Blue Wing sails across the Sea of Abaco. Our new numbers for Blue Wingâ€™s voltmeter are serving her pretty well. Every once in a while we have to turn off the fridge if the digits drop too low, but it is only for a couple of hours in the wee of the still dark morning as opposed to turning it off at sunset and on again until hours after sunrise like we were doing before. We have also started conserving battery power by pre-bailing the bilge before we make way, instead of waiting for the electric pump to come on when the water level gets too high. The Raymarine GPS we remounted from the nav station down below to the helm when Blue Wingâ€™s old GPS broke is doing great! We are so glad the old one broke! The â€œnewâ€ GPS is easy to read and the detail makes navigating tricky areas so much easier. The Raymarineâ€™s charts differ a little from our paper charts sometimes, so we have to be careful as to which one to trust and still do a lot of navigating by reading the water and watching out for rocks and land. 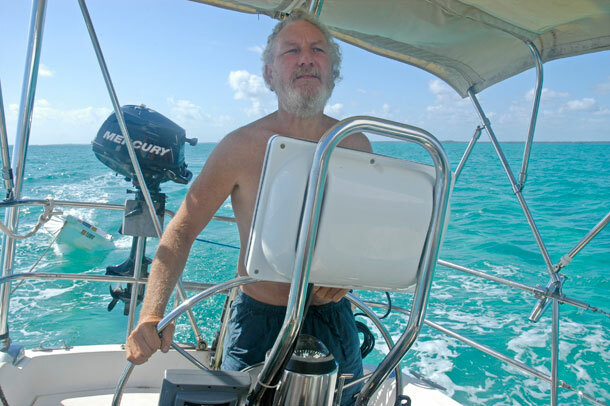 Greg sails Fever off of Tilloo Cay. Our dinghy, Fever, is still motorless. The outboard still has some issues. But this isnâ€™t really a problem for our Feve. He is an excellent rower and can go just about anywhere. He is also learning to sail! Fever came with a sail kit, so while we were doing some waiting at Tilloo Cay, we decided to finally rig him up. Being as it was our first time with Fever under sail we kept him tethered to Blue Wing in case he got too excited and lost control. He did great! Greg at Blue Wing’s helm. Greg, never accused of being a half-hearted consumer, is proud to report that there are many boxes of crackers and beers left on the boat. (However, the last bag of pistachios just now bit the dust.) And, while here in the Abacos, the lazy bum is eating store bought Ezekiel bread instead of making his own bread in the pressure cooker. Heâ€™s glad weâ€™ve started many new friendships this season, and looks forward to reuniting with cruisers and islanders we have met. He is also itchinâ€™ to see friends and family this summer. Heâ€™s proud that we have used less diesel fuel this season, and that much of that was used recharging the batteries. He likes using renewable resources and dreams of gearing up for next season with more solar panels, and possibly using pedal-power on those cloudy windless days. 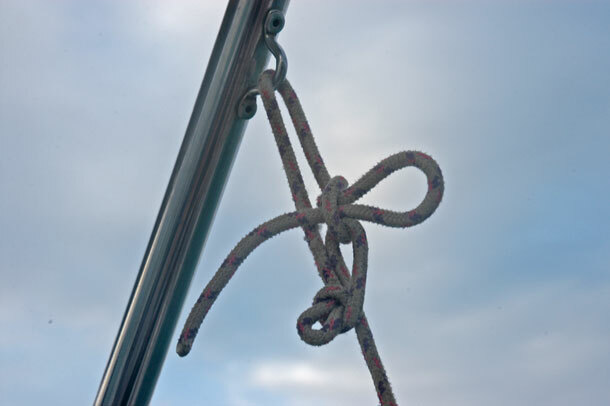 Mostly he wants to share this new cool knot he uses to tie down the Bimini. This trucker’s knot is surprisingly easy to tie. A tug on the end pulls it apart quickly. Good for lashing the dink down to the deck for ocean passages. 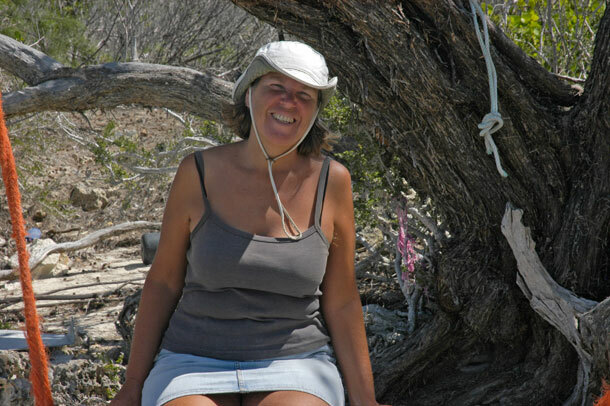 Since arriving in the Bahamas and crossing over many stretches big water, Duwan has managed to keep her food traveling the normal and much preferred route through her body. Although sometimes the surge in uncomfortable anchorages can cause a bit of stress, overall she has felt pretty good. Every once in a while looking out over the crystal clear waters in the lee of some island or walking on some sandy beach with the Atlantic roaring towards the shore she feels an amazing sense of wonder and true bliss. She has been practicing her helming skills. 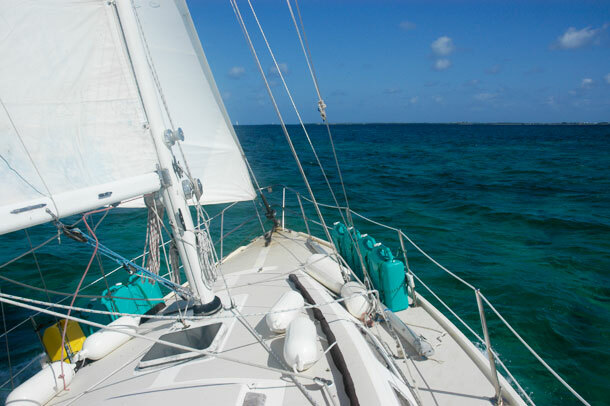 Sailing between the Abacos shallow sand bars and hazardous rocks offers a good opportunity to learn navigate from way point to way point keeping the best angle on the wind with each tack or jibe. Unfortunately she had let her goal of learning one song on the ukelelee lapse, but with all of the recent down time, she has picked it up again, toughened up her finger tips, and is back learning cord formations and how to strum in time. Duwan poses for a rare picture! Together they have been practicing sailing off the anchor. They havenâ€™t been real successful yet, but it has put them into the habit of motoring off the anchor with the sail raised, then sailing out of the anchorage. This is something they would have never tried last year, especially in a tight or crowed anchorage. Last year they would motored totally clear of the anchorage before heading into the wind to raise the sail. Their confidence in their skills has grown which is allowing them to grow their sailing skills. They are contemplating entering the Bight of Abacos which means navigating through a shallow and windy channel. This should be a real test of their improved sailing and navigations skills.